Vpbank Finance Company Limited (FE CREDIT) has recently been awarded as “Best Consumer Finance Company, South East Asia 2018” by Global Business Outlook. Global Business Outlook (GBO) is a prestigious publication in the United Kingdom. The Global Business Outlook awards are held annually, aiming to recognize and reward excellence in business to companies all over the globe, in both broad and niche sectors such as banking & finance, insurance, securities, real estate, technology, etc. The Awards Committee voted based on comprehensive criteria such as: business achievements, position and prestige of the companies in the region, product-service development strategy, risk management strategy and innovation technology that create breakthrough benefits for the customers. FE CREDIT has been announced as “Best Consumer Finance Company – South East Asia 2018” in the GBO’s Official Rankings 2018. According to GBO, FE CREDIT is highly ranked based on remarkable financial performance supported by innovative strategies and application of fintech in its business model to improve customer experience. In addition, FE CREDIT was applauded for (1) upgrading its risk management system, (2) transforming its payment process and (3) customising products and services to serve the diverse needs of the customers. FE CREDIT’s innovative marketing strategies has also resulted in impressive business results and outstanding growth for the company, demonstrating strong leadership in delivering financial inclusion in Southeast Asian financial community. Mr. Kalidas Ghose, CEO of FE CREDIT proudly shared: “FE CREDIT has maintained a leading position with its mission to help millions of Vietnamese people solve their financial problems, and thus improve their quality of life through our fast and easy lending experience. The “Best Consumer Finance Company, Southeast Asia 2018″ award affirms our reputation in the market in many aspects such as the full range of our products & services, highly efficient risk management framework supported by a superior customer service mechanism. To deliver this, we have implemented cutting edge technology platforms and developed a strong team of capable people drawn judiciously from a mix of local talents and overseas experience”. FE CREDIT takes pride in having one of the most modern and sophisticated technology architecture, integrating fast frontend customer channels with world class core banking and card management systems. In August 2018, FE CREDIT introduced its revolutionary solution, a fully automated lending platform called “$NAP” which is able to verify and on-board new customers within 15 minutes. Pioneering in consumer finance, FE CREDIT has established a solid foundation to become the market leader of the unsecured consumer lending market. FE CREDIT currently provides consumer lending services such as personal loans, two-wheeler loans, consumer durable loans, credit cards and bancassurance. FE CREDIT has served almost 10 million customers, co-operating with over 8,500 partners across more than 12,200 Points of Sales nationwide. 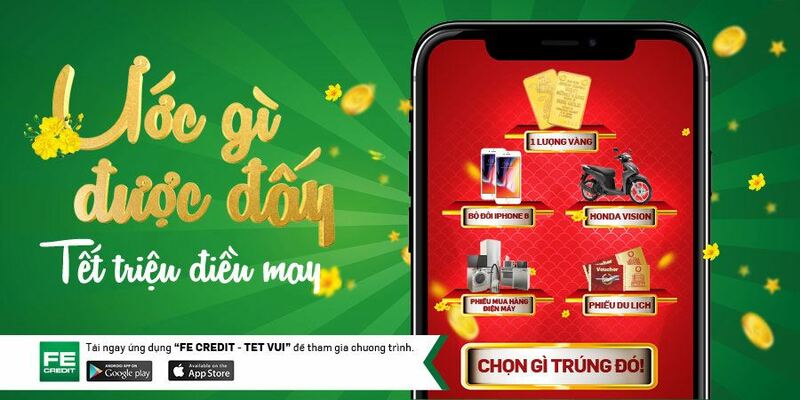 Moreover, the value of the FE CREDIT brand is also presented by noteworthy and respected national and international awards, including Best Consumer Finance Company Vietnam 2015-2016, Best Consumer Finance Brand South East Asia 2017, Cards & Electronic Payments International Asia 2017, Top 50 Vietnamese Organizations with Attractive Employer Brands 2017, Top 10 Asia Pacific Outstanding Brands 2018, etc.